King Kong is a slot which is easily to operate. In changing the settings, there are no special things to be aware of. In the lower left corner you’ll find the option to mute the sound, as well as the pay table, where you’ll find all the information on this slot. Likewise, you will also find the option to change your bet in the left side of the slot, which is made easy by the arrows. 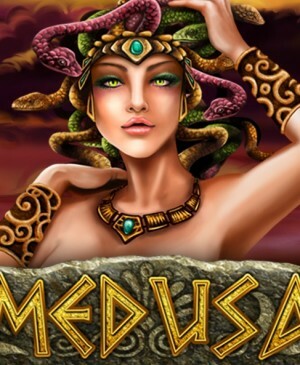 In the center you will then find the total amount of your wager, with next to it the money that remains on your account. Left on your screen you will find a spin button, with directly left to it the autoplay. You can set this up yourself, choosing a number of spins between 0 and 100. If you’ve won money, you can also choose to use the gamble option, which will appear directly above the spin button. 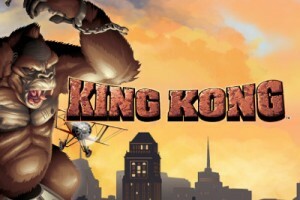 King Kong is a slot by developer NextGen Gaming that has five reels, three rows, a wild, a scatter symbol, and free spins. 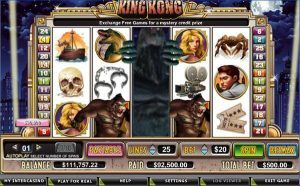 King Kong is a slot about the eponymous ape, which holds a large role in this slot, but it also features the dinosaur and a few other characters from the story. The slot also has an old Hollywood look to it. The only disappointment is that the sound effects have not been better tailored to the theme. When a win forms, the sound effects are awesome, but at other moments, they’re not more than mediocre, which is a shame because, in all other respects, the aesthetics of this slot are great. How to play King Kong? King Kong is a slot which is easy to operate. In changing the settings, there are no special things to be aware of. In the lower left corner, you’ll find the option to mute the sound, as well as the pay table, where you’ll find all the information about this slot. Likewise, you will also find the option to change your bet on the left-hand side of the slot using the arrows. In the center, you will find your total wager, with, next to it, your account balance. On the left of the slot, you will find the spin button, with directly left to it the autoplay. You can set up this autoplay yourself, choosing a number of spins between 0 and 100. After a successful spin, you can also choose to use the gamble option, which will appear directly above the spin button. To reach free spins on King Kong, all you have to do is get the scatter symbol on a pay line in threefold. If you succeed in this, a window will open. Through this window, you can try and hit airplanes out of the air like King Kong did. 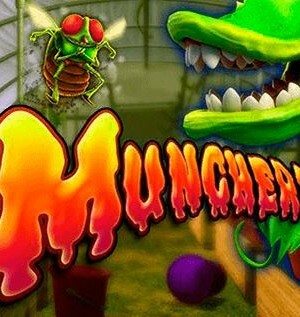 The number of planes you destroy determines the number of free spins you will subsequently receive. But rest assured, if you hit just one plane you’ll already get 15 free spins. If you manage to take down two, you’ll get 25, at three, it will be 50, and for four planes or more, you receive incredible amounts of free spins. 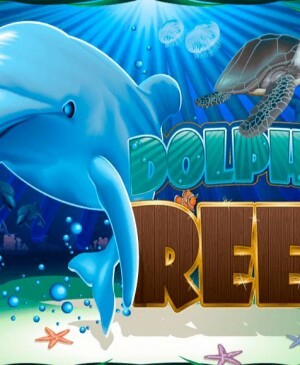 Namely, after having hit four planes you receive 75 free spins, for five you receive 100, and for six you will receive no less than 150 free spins. While this slot does not contain a bonus game (something which could have easily been included), the part of the game before the free spins where you get to take down the planes is a nice touch. Besides, the slot has a wild symbol which can only land on reels 2, 3, and 4; so precisely the reels you want the multiple wilds to land on. But there’s more; if the wild symbol lands on the third reel, first the wins you make with this wild will get calculated, whereafter King Kong will break out of reel 3 turning the entire reel wild. Additional wilds can still appear on the second and fourth reel. So, your chances of big wins will be sizable! 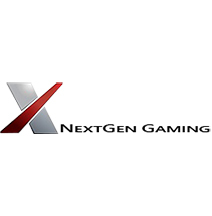 The slot does not have a jackpot, even though one might have easily fitted with the rest slot, but NextGen Gaming has clearly decided otherwise. And they could’ve been right to do so – with the number of free spins to be earned in this slot, you really don’t need a bonus game or jackpot.